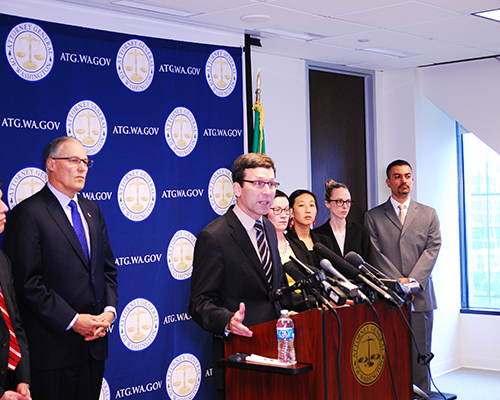 The ACLU of Washington submitted a friend-of-the-court brief supporting the lawsuit filed in federal court by Washington Attorney General Bob Ferguson on Jan. 30 seeking to have key provisions of the President’s Executive Order on immigration declared unconstitutional. The brief includes dramatic stories from Washington residents about the personal hardships they are suffering as a result of the order. “The harms of the Executive Order are reverberating across our community. Numerous individuals have contacted the ACLU of Washington to seek advice on how best to curtail its harm to themselves, their families, and their loved ones. It has made many Washington residents feel uncertain about the future and the stability of their jobs, their education, and their right to travel freely,” said ACLU of Washington Legal Director Emily Chiang. A citizen who has been hindered from reuniting with her husband and stepdaughter, who after two years of vetting had finally obtained visas to join her in our state. She is torn between them, who are from Iran and are banned from entering the U.S., and her ailing mother, who is in Washington and unable to travel. A person who feared for his mother, a Syrian national who has lived in Washington since 2011 and who was returning from a trip abroad to see his grandfather in light of a recent cancer diagnosis. Due to the Order, his mother changed her return flight to Vancouver, BC. Due to his mother’s age, he may need to join her in Vancouver if she is not soon permitted to re-enter the U.S. – separating from his family in Seattle and jeopardizing his employment. A U.S. citizen and her husband, a Syrian national with a CR-1 visa, who are currently in Germany after completing graduate education programs in Europe. They had planned to return to the U.S. but now fear they will be denied entry to the U.S. and will be unable to reunite with their family, all of whom live in Washington. A Syrian refugee family whose son, pregnant daughter, and daughter-in-law had obtained the necessary approval to rejoin their family in Washington but were turned away at the airport in Turkey due to the Order. They had already given up their housing and employment in anticipation of moving to the U.S. They are from Aleppo, Syria and are afraid to return to the conflict there. The brief says that the Order is discriminatory and is driven by animus toward Muslims, as confirmed by the President’s own public statements and the lack of any rational justification for the categorical exclusion of individuals from the seven identified nations, where approximately 96% of the citizens practice Islam. The ACLU urges the Court to grant the State’s motion for a Temporary Restraining Order and spare Washington residents and families from further irreparable harm. The brief was written by ACLU-WA cooperating attorneys Paul Lawrence, Kymberly Evanson, and Alanna Peterson of the Pacific Law Group LLP and ACLU-WA legal director Emily Chiang.